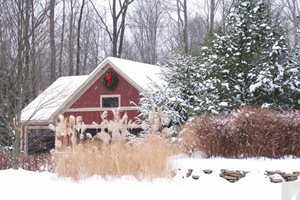 Winter LandscapesBrowse photos and get Ideas for winter landscaping. Careful installation and maintenance can prevent winter damage to pathways and patios. Patios, driveways and walkways have to stand up to a lot of abuse over the winter. 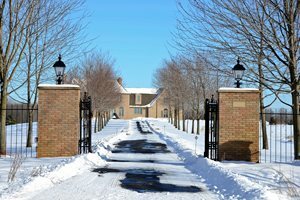 Frost heave, errant snow shovels, and corrosive deicing products can all damage these hard surfaces. However, with careful installation and regular maintenance, you can avoid problems and keep your landscape looking good for years to come. "A good base is key when building anything," says Andrew Morse of Belknap Landscape Co., Inc in Gilford, NH. Know your soil, make sure it's properly graded and compacted, and pay attention to drainage to ensure a stable installation. "While it varies by the type of paver you're using, in general you'll need about 4 to 6 inches of base rock for walkways, and 1 foot of base rock for driveways," says Joe Markell of Sunrise Landscape and Design in Sterling, VA. If you are using edging along your pathway to hold pavers or stone in place, avoid choosing plastic. "Plastic edging can heave up during cold weather," says Markell. A large quantity of water flowing over pavers or concrete can cause them to settle unevenly. "If a downspout is dumping into a confined area, it would be wise to use a high-quality pipe (not corrugated) to reroute that water to where it can drain," says Markell. Many pavers come pre-sealed and have a warranty covering their surface, so you can feel confident the materials are up to winter's challenges. Choose pavers with color throughout. Kyle Ritchie of Milieu Design LLC in Wheeling, IL points out that some concrete pavers have what's called a "face pour", where the top 1/8 inch of concrete is colored and the rest of the paver is not. This may save you money, but it makes chips and dings that much more obvious. If building a patio or pathway out of stone, select larger pieces as they will stay in place better than smaller pieces. Small stones are easily destabilized by the freeze/ thaw cycle. Pro Tip: In cold climates, never choose wood for steps or walkways. Wood absorbs water and so gets dangerously slippery in icy temperatures. Water can get into cracks or holes and break apart your pathway when it expands during a frost. You can use asphalt to seal cracks in the driveway, or Morse recommends using a product called Sandlock in between pavers, which forms a rubberized glue and keeps water out. Each year, check to make sure your pavers, stone and concrete are still level and don't have any edges sticking up that could catch on a snow shovel or plow, or worse, create a safety hazard. Seal pathways and patios regularly. Every region and material will call for a different amount of maintenance, so ask your landscaper at installation how often you ought to plan to seal the hard surfaces in your landscape and what products to use. Consider a sealant with grit. A sealant containing grit creates a non-slip surface that is safer to walk on in inclement weather. Use the right deicing products. "Don't use rock salt on concrete or bluestone," says Morse. "It'll deteriorate your materials fast." Instead, he recommends potassium chloride, magic salt, or straight sand as less-corrosive alternatives. Don't use metal snow shovels. The sharp edges of a metal snow shovel can scratch or ding pavers or decorative concrete. Instead, choose a shovel with a rubber blade edge, or use a mechanical broom which has soft bristles.